At the turn of the 19th century, there was an uneasy peace between the Cherokee and the ever-growing number of white settlers in the Smoky Mountains. A recurring problem was the boundary designating Cherokee lands from that of the newcomers. Throughout the 1790s, treaties had defined this boundary, and lines had been surveyed at different times. Each line had flaws. One survey left more than a hundred white families on Cherokee land and almost a dozen Cherokee villages in U.S. territory. In 1801, President Thomas Jefferson called for a survey to draw a new line that would settle the disputes. The task fell to two frontiersmen, Colonel Return Jonathan Meigs, Sr., and surveyor Thomas Freeman. This daunting project required traversing many miles of wilderness from the Iron Mountains of Tennessee, into North Carolina, down to the border with South Carolina. Freeman and Meigs were excellent choices for the job, in part because both had an unquenchable desire to see what lay beyond the next ridge. Freeman was a brilliant scientist and surveyor from Ireland. Under President Washington, he charted the new capitol of Washington, D.C. He later helped survey the boundary between Spanish Florida and the United States. In 1806, on an expedition similar to that of Lewis and Clark, President Jefferson sent him and naturalist Peter Curtis on an exploration that took them as far west as the Red River in present-day Texas. The two men faced a delicate situation when they set out in the summer of 1802. Ever the diplomat, Meigs included people from the Cherokee Nation, as well as white settlers in his party. 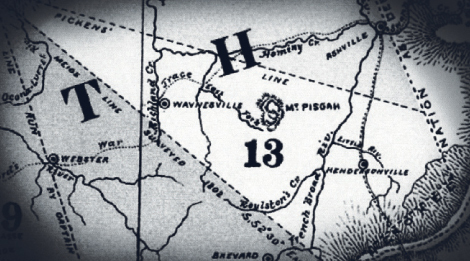 difference between the boundary laid by Colonel Benjamin Hawkins and General Andrew Pickens, and another by Lieutenant Colonel Thomas Butler. But much detailed knowledge of the line, which was observed until 1819, was obscured by time. But in 1970, Great Smoky Mountain National Park rangers Dwight McCarter, Vinn Garoon, and Joe Kelley set their minds on finding and following the original line. McCarter and Garoon did the tracking, using original maps, an antique compass, what remained of Meigs’ journal entries, and their own considerable backcountry expertise. Afterward, McCarter and Kelley wrote a book titled, Meigs Line, which chronicles the adventure. To call it walking is an understatement. Tracing the line meant climbing mountains and using skills akin to those of frontiersmen. What’s more, they were searching for blazes hidden by more than 200 years of forest growth with limited documentation. “Most of Meigs’ journal was lost during the War of 1812, when the British set fire to Washington,” explains McCarter. “Luckily, Dolly Madison was able to save portions of it, so we had that to go by. McCarter and Garoon traveled only with backpacks. Setting their compass to the heading Meigs used (S52°30’E), they left from the same place near Kingston—now called Meigs Mountain. Meigs and Freeman had delineated the boundary in various ways. They blazed trees using notching patterns such as arrows and crowfeet. They also marked boulders, usually with markings recognizable to the white man and Cherokee. Even unusual land forms and the natural arrangement of trees—three growing in a row, for instance—indicated the line. It’s remarkable that many of these trees and markings survived two centuries. That McCarter and Garoon were able to discover and discern them is astounding. The marks were sometimes hidden amid thick brambles. In one case, crowfoot notches were 20 feet up a tree trunk because of growth. As they trekked across the mountains, climbing terrain so rugged it taxed even their mountain-hardy constitutions, they kept to the compass. When they reached Caeser’s Head, they had traveled just fewer than 60 miles. The trip took almost two months, just as it had for Meigs and Freeman. Yet Kelley and McCarter didn’t want the quest to end.